Production: Sovkino Studies, Leningrad; black and white, silent; 6 reels, running time: 111 minutes. Released 1929. Re-screened with original score at London Film Festival, 1982. Screenplay: Grigori Kozintsev and Leonid Trauberg, from an idea by P. Bliakin; photography: Andrei Moskvin and E. Mikhailov; art director: Yevgeni Enei; music: Dimitry Shostakovitch; historical consultant: A. Molok. Cast: Elena Kuzmina ( Louise Poirier ); Piotr Sobolevskii ( Jean the Soldier ); David Gutman ( Grasselin ); Sophie Magarill ( An Actress ); Sergei Gerasimov ( Lutro, a journalist ); S. Gusev ( Old Poirier ); Janina Jeimo ( Therese, a needlewoman ); A. Gluchkova ( Washerwoman ); Evgeni Cherviakov ( Soldier in National Guard ); Andrei Kostrichkin ( Old shop assistant ); Anna Zarazhinskaia ( Young girl at barricades ); Vsevolod Pudovkin ( Shop assistant ). Kozintsev, Grigori, and Leonid Trauberg, Novyi Vavilon , in Avant-Scène du Cinéma (Paris), December 1978. Leyda, Jay, Kino , London, 1960. Schnitzer, Jean and Luda, Le Cinéma sovietique par ceux qui l'ont fait , Paris, 1966; as Cinema in Revolution: The Heroic Era of the Soviet Film , London, 1973. Verdone, Mario, and Barthélemy Amengual, La Feks , Paris, 1970. Furhammer, Leif, and Folke Isaksson, Politics and Film , London, 1971. Rapisarda, Giusi, editor, La Feks: Kozintsev e Trauberg , Rome, 1975. Christie, Ian, and John Gillett, Futurism, Formalism, FEKS: Eccentrism and Soviet Cinema 1918–36 , London, 1978. Leaming, Barbara, Grigori Kozintsev , Boston, 1980. Christie, Ian, and Richard Taylor, editors, The Film Factory: Russian and Soviet Cinema in Documents 1896–1939 , London, 1988. Houten, Theodore van, Leonid Trauberg and His Films: Always the Unexpected , 's-Hertogenbosch, 1989. Close Up (London), June 1929. New York Times , 2 December 1929. Variety (New York), 4 December 1929. Times (London), 21 November 1935. Kozintsev, Grigori, in Cahiers du Cinéma (Paris), July and August-September 1971. Pulleine, Tim, in Guardian (London), 17 September 1982. Brown, Geoff, in Times (London), 18 September 1982. Variety (New York), 6 October 1982. Eisenschitz, B., "La Musique du silence," in Cinématographe (Paris), November 1982. Elley, Derek, in Films and Filming (London), November 1982. Dignam, Virginia, in Morning Star (London), 7 January 1983. New York Times , 3 and 5 October 1983. Robinson, David, interview with Leonid Trauberg, in Times (London), 20 November 1983. Leyda, Jay, "Un cinema fatto e pezzi per la musica di Sostakovic," in Cinema Nuovo (Bari), February 1984. Listener (London), 23 January 1985. Morrison, Richard, in Times (London), 13 January 1986. Nusinova, N., " Novyi Vavilon: stareiut li fil'my?" in Iskusstvo Kino (Moscow), no. 4, 1990. Tsikounas, M., "Il était excentrique," in Positif (Paris), no. 363, May 1991. The New Babylon is a metaphorical clash of glittering surfaces and deep social cynicism that marked the climax of Grigori Kozintsev and Leonid Trauberg's experimentations with the conventions of the Soviet silent cinema. Taking their thematic inspiration from the story of the Paris Commune of 1871, the two directors fashioned a highly conceptualized allegory of social strata under pressure that transcends its historical roots to form a sardonic comment on the human condition. In actuality, the commune had been composed of a group of French patriots who seized power during the Franco-Prussian War after the city of Paris fell before the advance of the Germanic invaders. Though the experiment in communal government lasted but a few short weeks, it caught the attention of Marxists and Socialists alike. Yet, it was not strictly the commune's historical reality that inspired Kozintsev and Trauberg. It was the movement's symbolic re-invention of "The City of Light"—an attempt at the creation of a universal socialistic "Paris of the Mind" that the two Soviet artists found most intriguing. 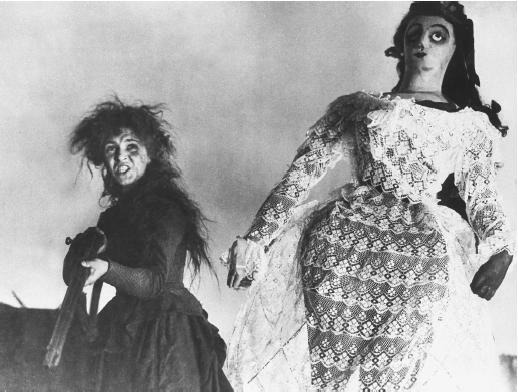 In 1921, Kozintsev and Trauberg had created FEKS, The Factory of the Eccentric Actor, a theatre group dedicated to the creation of avant-garde and unorthodox productions. After producing a number of controversial multi-media stage representations, the two found their true forum in the cinema, and made six highly experimental films between 1924 and 1927. The New Babylon , which began production in 1928, was their first project undertaken with the support of the Soviet government. of the film, a fast-moving camera and a collage of glittering images portrays the store as an idolatrous Babylonian temple awash with materialistic and fleshly pleasures. The mode of representation, at this point, is expressionistic in nature but not the type of dark, moody distortionism embodied by the German aesthetics of the early 1920s. Expressionism, as employed by Kozintsev and Trauberg, is much lighter, and makes calculated use of glitter and flamboyance as rhetorical devices within a visual collage. For example, the frenetic sequence of images that dominates the early department-store scenes emphasizes lavish sets strewn with such exotic objects as brocades, kimonos, fans, and parasols, and an agitated salesman (played by Vsevolod Pudovkin) hawking his wares. Such imagery dynamically conveys the psychological preoccupations of the bourgeoisie who frequent the store. The disparate groups that comprise the film's "class struggle" are joined and commented upon through the interactions of Louise Poirier (Elena Kuzmina), a salesgirl at the store. Forced by the circumstances of her position to cater to the whims of the rich, it is clear that her sympathies are actually with the working-class patriots who will form the Commune. The actress Kuzmina wrote some years afterwards that the character of Louise was, ironically, not found in the literature of the time but was instead intended to be a synthetic communist girl representing the entire epoch. The frenzy of contrasts conveyed by the opening scenes of a sale in progress at the New Babylon is sustained in the subsequent scenes of an uncomfortable Louise at the music hall. But here the filmmakers vary their mode of expression somewhat by constantly interspersing the fast-moving camera work with isolated, almost static vignettes unfolding against action filled backdrops. Prominent among these latter events is the meeting between Louise and Jean, a soldier who becomes her lover as the Prussians march into Paris. In the film's middle and later segments, which are more conventionally sequential in nature. The early expressionism gives way to the more clearly delineated realism embodied in the battle scenes. Here, it is a combination of longer, more slowly moving sequences interspersed with short episodes that show the fall of the Paris administrative seat and the rise of the Commune. When the Commune is ultimately betrayed by the bourgeoisie and attacked by the soldiers, Kozintsev and Trauberg create a heightened sense of irony by blending pastoral and battle images in a gross parody of reality. Through the use of repugnant close-ups of aristocrats picnicking on a hilltop at Versailles as the battle rages below, the self-serving treason of the upper classes is brought sharply into contrast with the patriotism of the workers. The film shifts dramatically between portraits of bloated faces sipping champagne and the blank faces of the dead communards on the barricades. The New Babylon derives much of its energy and momentum from its union of narrative styles. On the visual level, the cinematography of former graphic artist Andrei Moskvin intersperses crisp black and white images reminiscent of fine engravings with the glitzy, stylized, and more softly rendered representations characteristic of Soviet expressionism. The latter visual style is also highly evident in the performances of the actors. The exaggerated facial expressions and gestures of the actors evident in such scenes as the one in the music hall are used to symbolize psychological states rather than to convey simple emotions. Finally, in a number of instances, images and motifs are structured into fast-moving collages designed to distance the viewer emotionally from the action and to elicit an intellectual awareness of how various visual components of the film interact with others to produce a particular meaning. The music, by Dimitry Shostakovitch, is also integral to the film's narrative structure. Normally in film, the music serves to compliment or amplify the visual image. The relationship is one of conjunction. In The New Babylon , however, Shostakovitch creates a relationship through the opposition of sound and image. In the music hall scene, for example, the composer interfaces components of the "can-can" and the "Marseillaise" with the vulgar spectacle of the pageant to form a musical comment on the French middle class. Although the avant-garde aspects of The New Babylon caused it to fall somewhat in disfavor during the regime of Josef Stalin, it is precisely those elements that cause it to remain of interest today. Although ranking somewhat below the pioneering efforts of Sergei Eisenstein and Vsevolod Pudovkin whose theories greatly influenced its creation, The New Babylon still represents an innovative use of the cinema and one of the highpoints of the Soviet silent cinema.